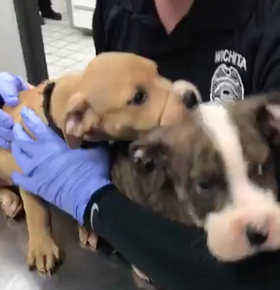 SEDGWICK COUNTY — Animal Control officials saved two puppies found with rubber bands around their mouths at an apartment in Wichita Wednesday, according to Sarah Coffman, executive director of Wichita Animal Action League. According to the organization’s Facebook page, a maintenance man entered the apartment after a pipe above it burst, and was flooding the apartment. Knowing dogs weren’t allowed at the apartment, he looked in the kennel in the corner. 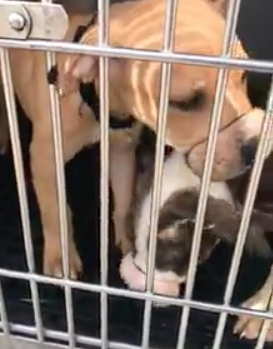 Two puppies were huddled in ankle deep feces and urine, completely quiet. Their mouths were wrapped shut with rubber bands, to keep them quiet so the landlord wouldn’t find out. A Good Samaritan alerted a foster who alerted Wichita Animal Action League. A small, bizarre chain of events allowed authorities to rescue them just in time. The doctors do not think they will have any lasting tissue or nerve damage. But it was a very close call, according to Coffman. 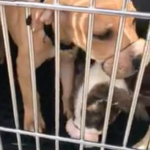 They will be available for adoption in a few weeks and you can apply at WAALrescue.org/adoptions if interested.